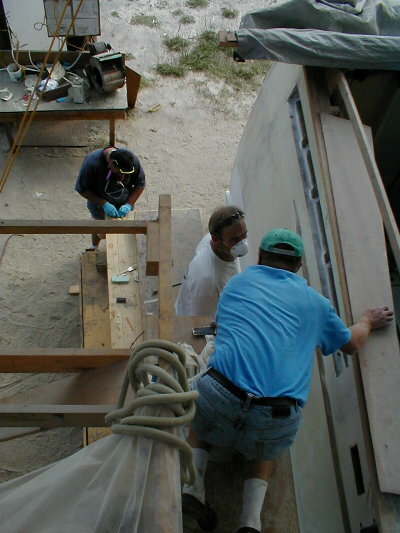 September 24, 2001 It has been exactly one year since Cherokee got a roof over her head and the first Huckins Update page went up. Glad to be past the ripped-out and torn-down phase, Cherokee is looking good on the runway to integrity and grace. During this blustery, soggy week of rain, rain, and more rain, the Huckins is withstanding the indignity of wearing Spring colors during the onset of Autumn. 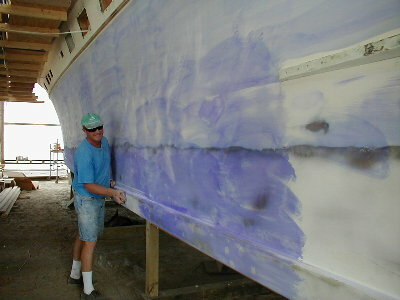 Her hull has been painted Easter purple, which is getting sanded off to detect uneven places in need of filling. The newest crewmember is Tom Parker, carpenter and drummer extraordinaire. A native New Yorker, Tom likes a fast pace and a full “to-do” list. Starting off with one of the nobler jobs, he’s working on the waste plumbing by gluing it together and testing it for leaks. 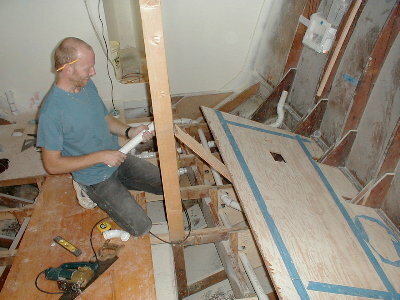 Meanwhile, Jim is fabricating the tumble-home rub rails. “Tumble-home” or “housing in” is the opposite of flare. Old wooden warships were known for their tumble-home sides, where the width of the upper deck was less than the lower decks to accomodate the bigger guns below (bigger engines in this case). 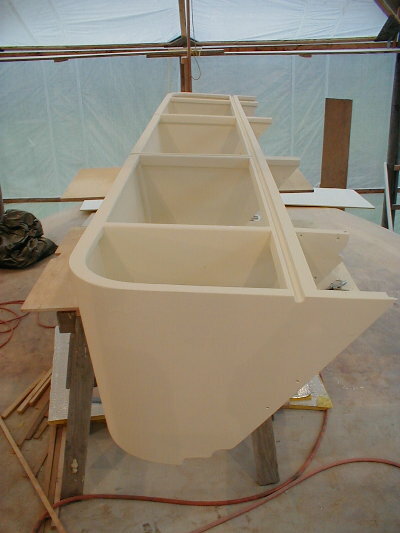 The deck boxes or lockers continue to be built, sanded, and painted. These will double as storage and seating. The box below awaits a coat of paint. 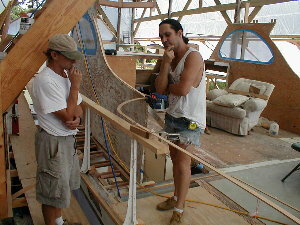 Bryan and Jeff have been busy planning the wing wall and door that leads forward. 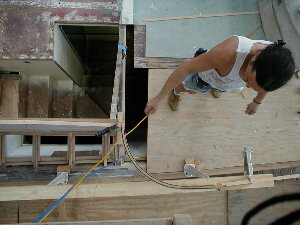 The wing wall will incorporate a settee/deck box. 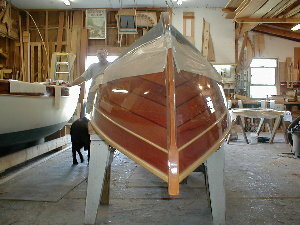 The wing door leading forward is shaped in a quarter circle. 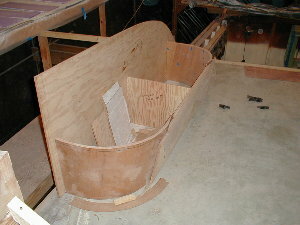 Below left is a wing wall with its settee. 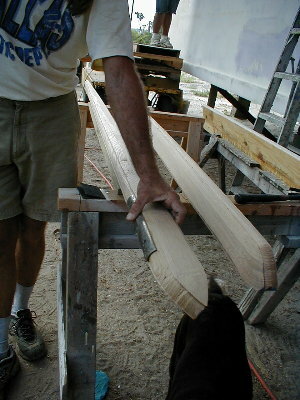 A pattern in the shape of a wing door lies on the deck in open position, which will nestle against the settee when opened. 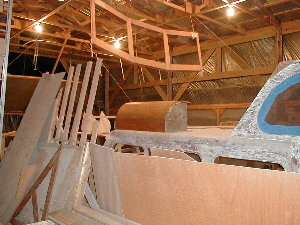 On the right, the form shown atop of the boat is used to laminate the corners of the deck box/settee along the wing wall as well as the wing door itself. Bill Brown wanted to make sure we got a picture of the new oil pans. 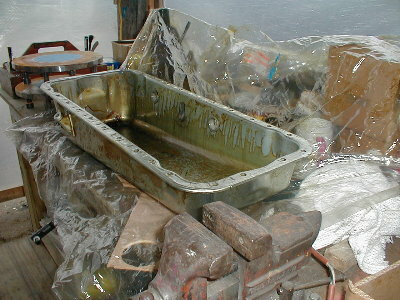 Below is one of two low-profile pans getting prepped for paint.